Needless to say, the kids quickly saw something wrong with this picture. “This isn’t enough money to live on!” many began to exclaim as they filled in the budget chart. My friend then extended the lesson by having her students read from NYC Comptroller John C. Liu’s “Beyond High School” report, which emphasizes the fact that a large percentage of NYC students do not seek higher education. Liu argues that in order to “achieve long-term fiscal balance, economic prosperity, and an improved quality of urban life in New York City,” more city residents need to go on to earn post-secondary degrees. What I find most valuable about this eye-opening lesson is that the teacher didn’t simply tell her students this information. She let them figure it out – but not the hard way (far too many people figure this stuff out after they leave high school, not while they’re still in high school). By giving students this kind of statistical information and having them interpret how it might relate to their lives – while they are still in high school – we can begin to convey the value of earning a high school diploma and continuing on to earn post-secondary degrees. 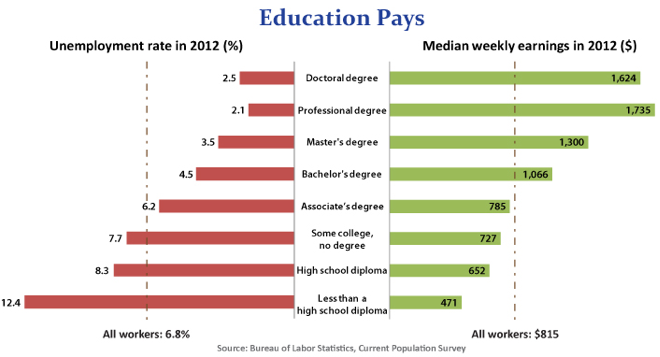 Of course, degrees and money aren’t the most important things in life, and there are plenty of other and better reasons to get a high school education and go on to higher education. But students get it when it’s put in terms of money, and that’s a place to start, to hook them into this conversation in a way that feels meaningful and relevant to them now. For all the naysayers who speak against the value of further education, it appears that having post-secondary actually does pay off. See this graphic. For me, education is more than just the money you can make with your degree (I did study English and Social Sciences, after all), and I also find I have more options at my fingertips because of my degree.